Served Daily from 11 am - 9 pm in January. Dine-In Only. 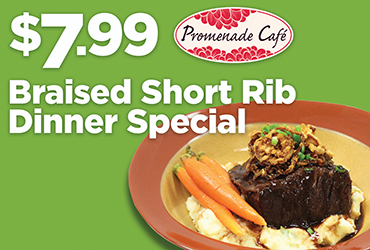 Beginning November 1st, $7.99 Braised Short Rib Special is served daily from 11 a.m. to 9 p.m. with mashed potatoes and baby carrots. Dine in only. For great dining deals, visit Promenade Cafe often to see what is new.